The son & heir has recently – yesterday – vacated Neu Schloss von Peter to return to Dunedin for some work to generate a little of that that all important commodity money in preparation for his 2019 year of study. During the most recent sojourn at Neu Schloss von Peter there was some hobby related activity. Some games were played with friend(s?) and we played a couple of Lord of the Rings games with the spoils spilt with a game apiece. The son & heir also managed to waft paint brushes and various other modelling implements around while here. The Haradrim Raiders were built and painted as were a few other Haradrim figures which will be unveiled to the world once some photos have been snapped. 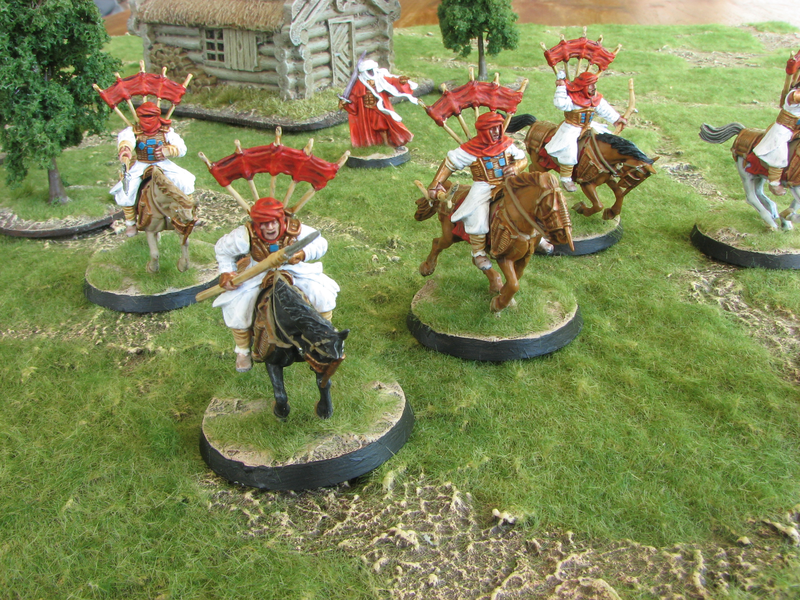 A box worth of Haradrim warriors were built and the painting started though these are still a work in progress. Yes, fantasy arabs were the theme of the season. One other hobby undertaking was undertaken. At the commencement of the PRIOR Christmas holiday season a sheet of mdf type board was purchased as The son & heir had urgings to make a terrain board. Over the duration of that holiday season the board was painted top, bottom and sides … and that was it! Apparently the paint needed to be really REALLY dry! This Christmas holiday season saw further activity. The board was subtly rendered into smaller constituent pieces with the aid of a circular saw! One of these pieces was then plastered, painted, dry brushed with several colours and then static grass applied. The accompanying pictures detail the results. FYI and FWIW the board is 60cm square. Click the images for larger and clearer views. Way back in November 2017 von Peter himself unleashed “WWI exhibition, paints and more“. Live moment to moment, as the ANZAC troops did in the trenches at Gallipoli, only a bomb’s throw away from the Turks. In this unique re-creation of Quinn’s Post, encounter the noise, the explosions, the stench, the confined environment those men had to deal with during the ferocious struggle between opposing forces. At times confronting, this will be an experience like no other! von Peter himself has received several reports of the The Quinn’s Post Trench Experience and all were very positive. The son & heir even took a young lady friend along – admittedly a little weird 😀 – and they both enjoyed it. A miss for von Peter himself. Idiot! when sourced from a local online distributer Mightyape that same 12ml pottle of Citadel paint would cost NZD 6.49 … but then I would need to pay postage on top. von Peter himself may never get rich on his savings but it appears that a little planning ahead to keep a reserve supply of paints in stock still pays off for the bulk of von Peters paints. Note that a comparison with Vallejo paints has not been undertaken due to a general idleness and because von Peter himself does not like their eye dropper bottles. Who doesn’t like a little bit of alliteration in a title? The final fighting Bavarian unit as per the original plan has made its way to the front and is available for the mayhem that generally ensues up there. The original plan was to recreate Generalmajor Beckers brigade of Generallieutenant Raglovich’s 29th (Bavarian) Division circa 1813 plus a few supporting units. This would have provided five battalions, an artillery battery and a cavalry regiment. These are now all present and ready for action. Four more casualty markers also accompanied the new battalion to the front though only one is specific to that battalion. Those cunning Bavarians have thought of everything! Thanks to Nigel Fun-nell for painting these chaps and all the other Bavarians. Horses, choreography and basing by von Peter himself. Flags from GMB Designs. Yet another Salute has come and gone. Once upon a time von Peter himself would have been referring The dear readers to sites displaying photos of the event but the advancing march of technology means that there are ever more videos of the event to be viewed. Some are linked below if The dear reader has the inclination … and time. How in the world did that happen?! 😇 von Peter himself is hearing good things about these rules from TooFatLardies. There’s a slight shortage of tanks at Neu Schloss von Peter. 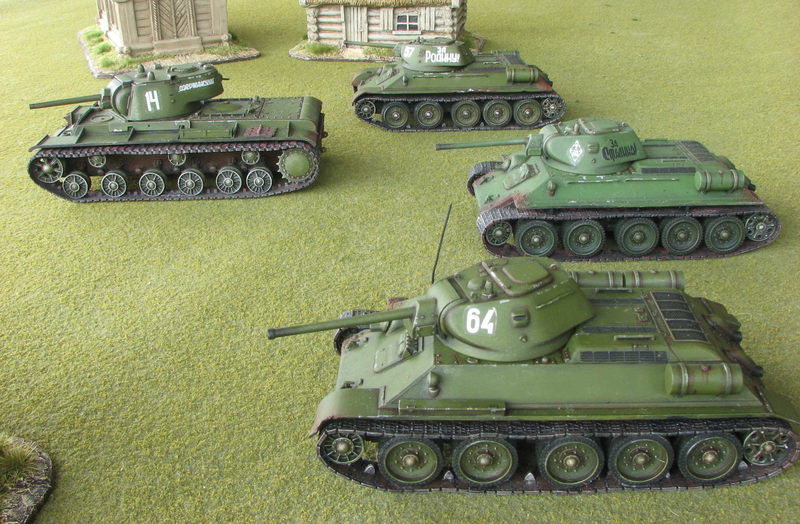 In 28mm there are three T34/75s and a KV-1 all ready to game. In 20mm there is a German Stug. IV early version and a Russian SU-85M in a ready to game condition. There are also 3 T34/75s kits still resting in their boxes. One option is to get hold of some 28mm German armour. But then von Peter himself sees his long term WWII gaming being in 20mm. Then again there is always the option of a more skirmish level of gaming in 28mm. Decisions decisions. The Lardies run through a small game of What a Tanker, showing off various aspects of how the rules work. Big Rich has a Stug III and a Panzer IV, whereas Fat Nick has gone unusually lightweight with a Stuart and an M10 Tank Destroyer. There is also an independent review over on the Skirmish Wargaming site. Should you need some sound effects the BBC have a deal for you at their BBC Sound Effects site. At the time of typing their were 167,016 effects available and some are even of a military bent. And to finish with a visual treat. 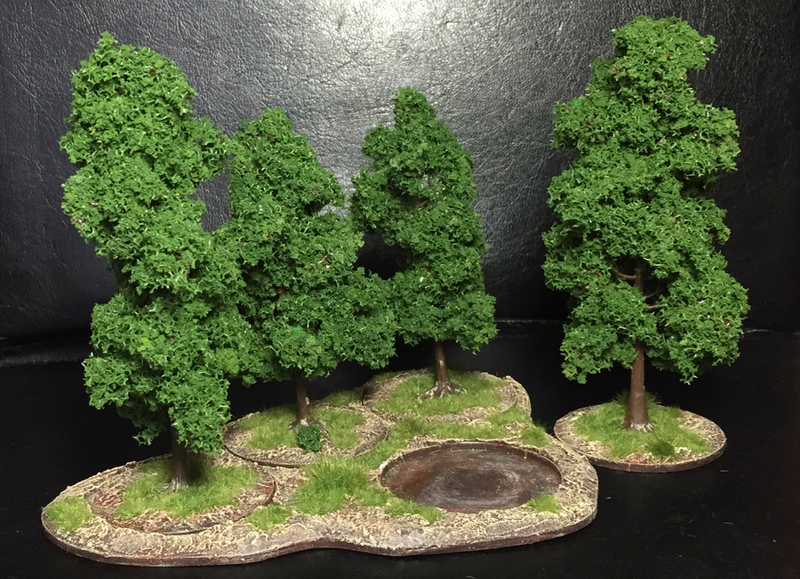 OSHIRO modelterrain make terrain. Surprise! We produce a large range of Japanese wargaming tarrain as well as expanding ranges incuding; Chinese, Boxer Rebillion, Victorian, Sci-Fi and near future. 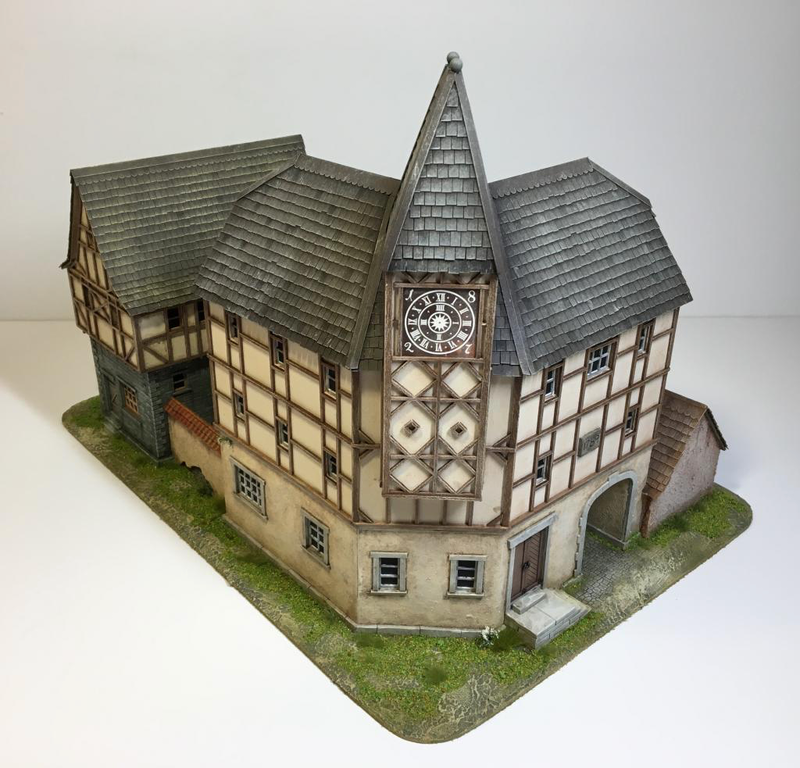 To see more pictures of this second model and also of the first click here for the relevant post in the Lead Adventure Forum. There may be a third model. Here’s hoping and that pictures of it will be available in due course. Great galloping warhorses. The month of January of the year 2018 is nearly a done deal and von Peter himself has yet to submit a post to this here blog. The blame is officially being laid at the feet of the holiday season, the continued warmer than normal temperatures here in Godzone – New Zealand to the uneducated, the pixies at the bottom of the garden and any and everything but von Peter himself! Better post something – anything! – to confirm von Peter’s continued presence on planet Earth before the end of January 2018. In the prior post von Peter himself alerted the world to the ongoing destructive activities of that most notorious & dastardly French sympathising Keela* and her latest act of espionage – a savage unprovoked and wanton attack on a 28mm scale outhouse. * The local – for now anyway!! – Irish Terrier. 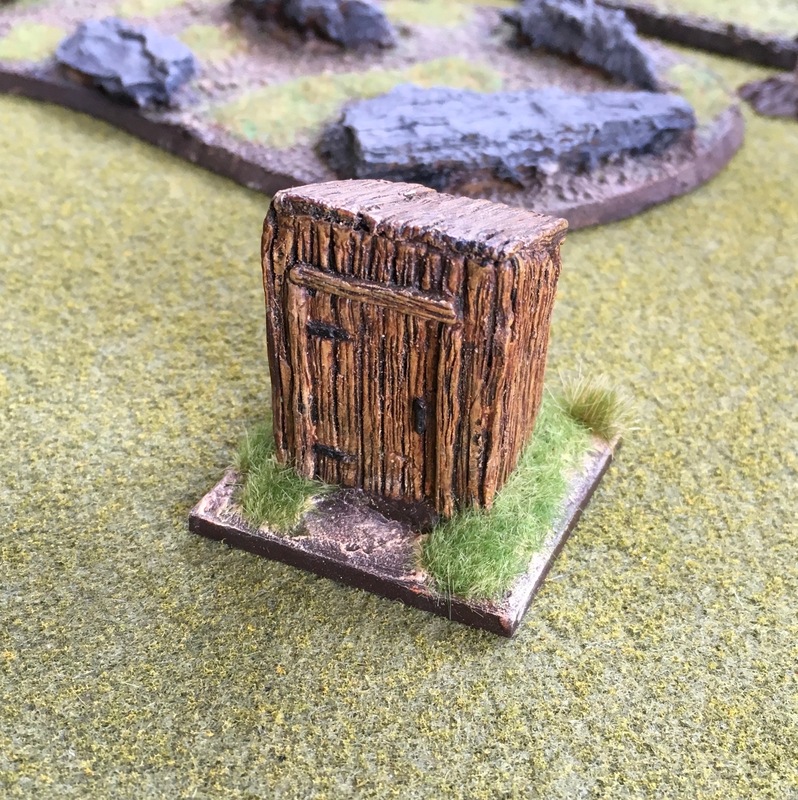 With the pleasure akin to that derived from spitting in your enemies eyes von Peter himself is pleased to report that the outhouse is once more fully functional … to the relief of many a 28mm figurine! The old partially consumed plasticard base has been replaced with one of plywood; the ground work restored; and the paint job touched up. The outhouse is once more open for business. 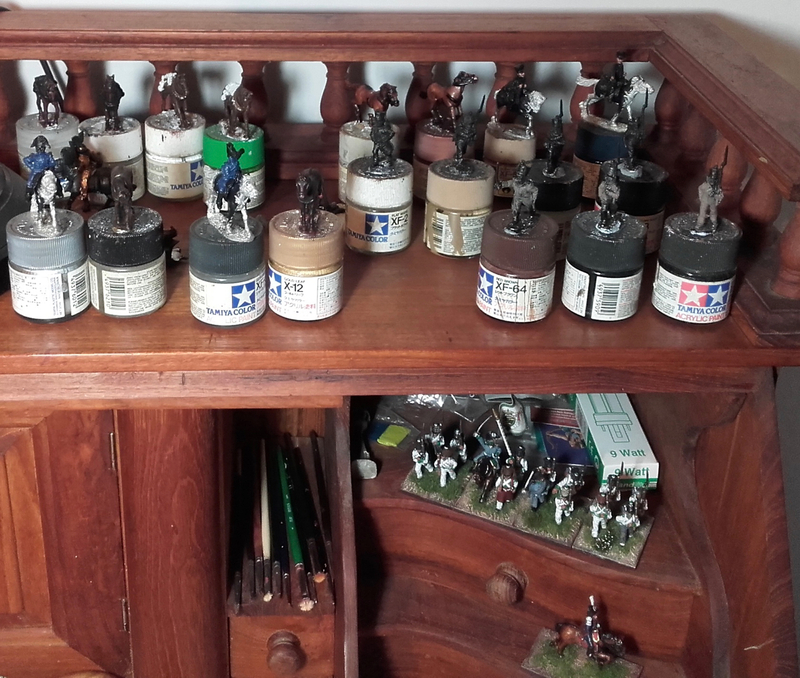 The latest view of the paint desk. And it presents a fairly shameful visage. The pendulum that produced a surge of activity pre the Wagram games has swung remorselessly back to a subsequent period of umm … errr … “reduced activity”. Sob! Click the image for a larger and clearer view of von Peter’s shame! So let’s examine what is currently in process left to right and row by row. four French infantrymen to complete the 4/132nd Ligne. The three fusiliers have been undercoated black but the standard bearer remains pristine silver. The thought was to create the flag staff and glue it on as a precursor to the painting process but a rummage through the unpigmented French figure box reveals the absence of Calpe’s F48 pack: “3 Battalion standard spear points pre-1812 reforms. These were used almost exclusively until Napoleons abdication in 1814”. As a result the figure will soon get blackened minus a flag staff. A Prussian casualty figure. The poor chap has been like this for years. Medic!!! the mounted adc from Calpe Miniatures Saxon pack SC3. By way of a repeat explanation von Peter himself provided a small Saxon brigade for the Wagram games. The thought occurred that it would probably be nice to supply a commanding officer of a Saxon disposition for the brigade. This figure on his temporary one man and his horse base is the result of that thinking. 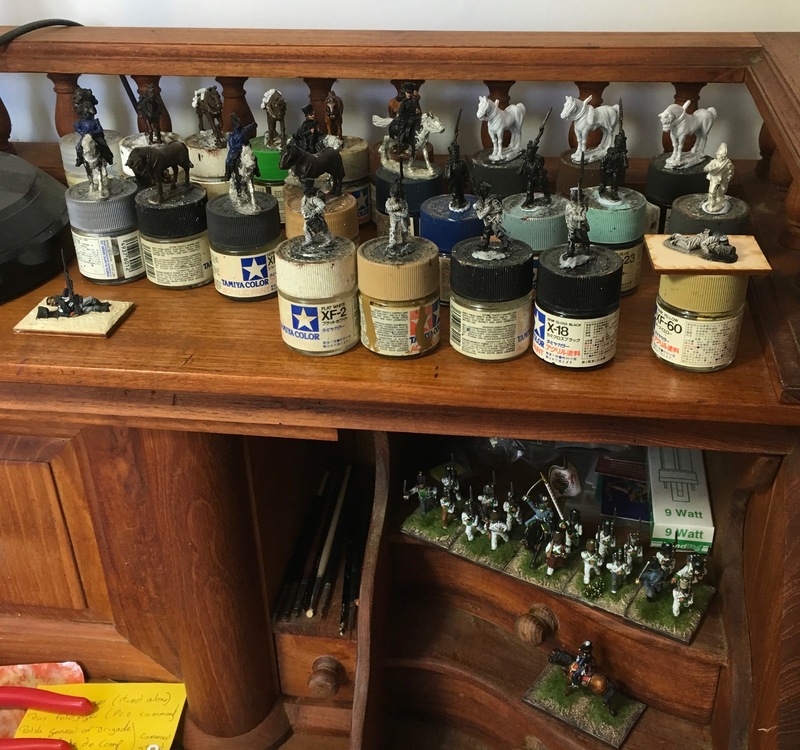 If the commanding colonel and adjoint – see the Middle row above – ever get completed all three figures will be grouped together on a single base. No change here either unsurprisingly. In a desperate attempt to provide some meaningful content von Peter himself has raided his archives for an image that may be of interest to The dear readers. All the way back to the 30th September 2006 and the Call to Arms convention of that year. 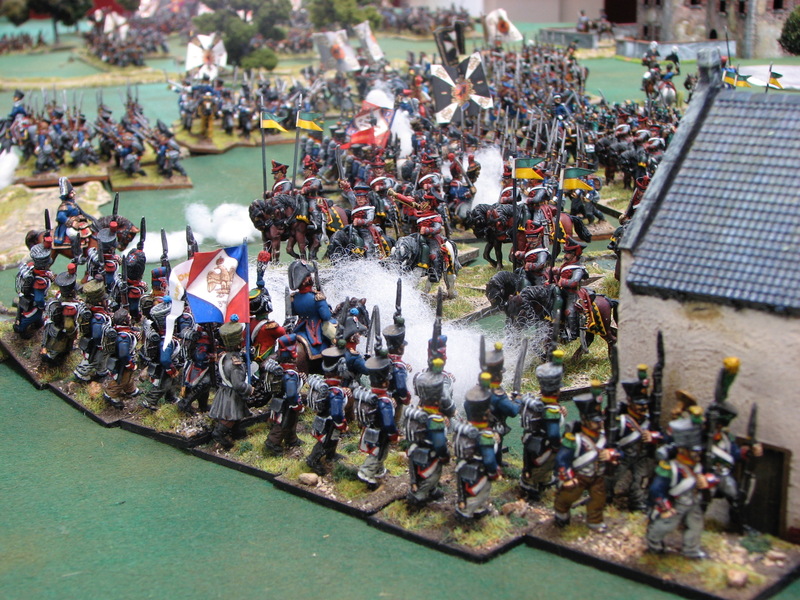 Four of us played a Napoleonic game for a day using the Field of Battle rules from Piquet Inc. 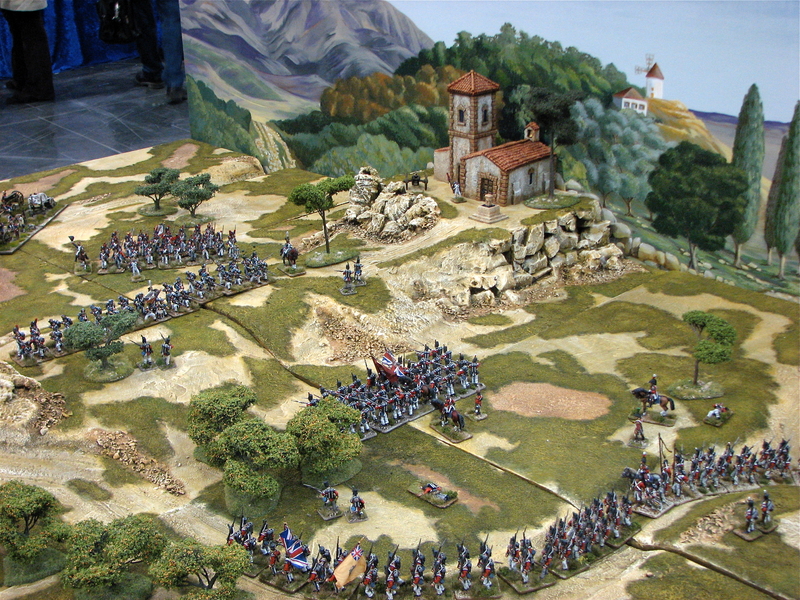 The game saw a Prussian-Russian force tangling with a somewhat unusual alliance of French, Spanish & Portuguese. Such are the exigencies of war … and gamers available figure collections. According to a write-up of the game it had suitable highs and lows for both sides but in the end the highs were more with the French and their bed fellows. Darn! Above: From the safety of the rear areas – is that him doffing his bicorne in the distance upper right – Murray bravely orders some Russian hussars to frontally charge a French ligne / line battalion who are coincidently formed in line! The results of the charge are lost in those mists of time. Click for a larger and improved image. von Peter himself has ‘grown’ his first pack of 4Ground trees. For the record the pack was “4 Young Chestnut Trees”. Some lessons were learned along the way. Nothing major and mostly to do with the holes on the optional sabot base and the plastering around them. Hopefully the building of the next packs will benefit from the learnings. The plastic branches are bendable so the shape of the tress can be modified. In this pack there were two larger trees of approximately 11.5cm and two smaller of approximately 9.5cm. Above: three of the young chestnut trees in their sabot base and one individualist who is not. Large scale fixed terrain battlefields – are you CRAZY! by Paul Weakley. Possibly not surprisingly this is written by that same Paul Weakley who created the terrain boards. There are more articles to come. 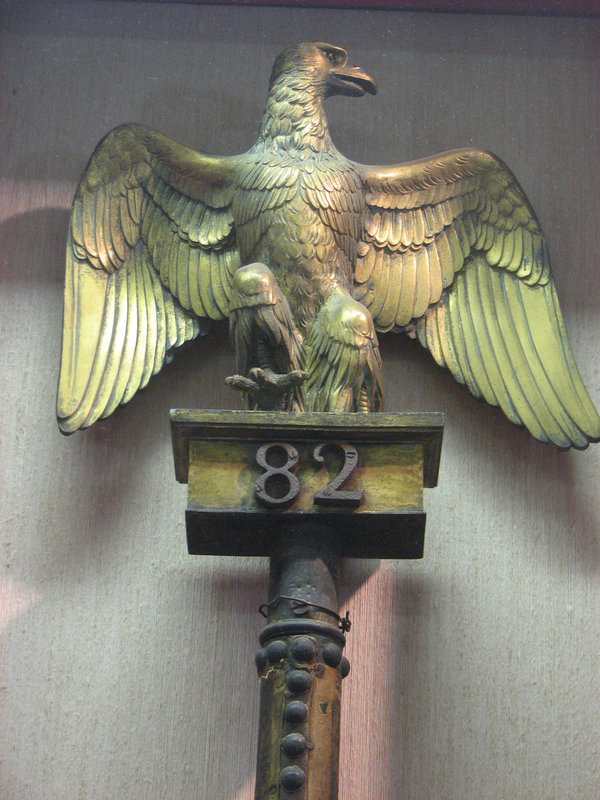 Above: This picture shows the extent of GdK von Peter himself Freidrich Hohenzollern’s Austrian II Army Corps. Oh … and the bodies in the background are the Saturday Wagram II crew. Motley covers it! 😃 Photo care of John H.
Above: a shameful scene from the Sunday. 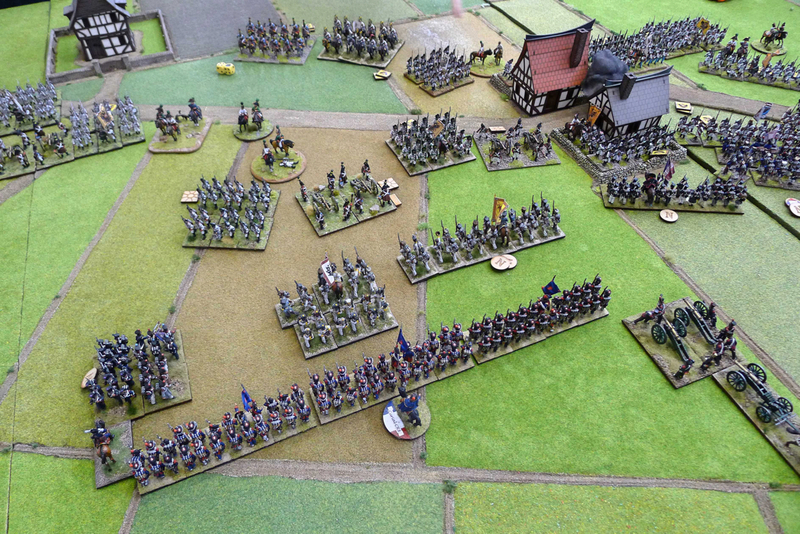 Two Saxon battalions in front of Austrian artillery – and the rest of the Austrian army! – being used as some sort of ablative armour for the ‘brave’ French troops wearing bear skins behind them. The 1/Prinz Maximilian Infantry Regiment – white flag with red border – appears to be formed in some sort of square arrangement while the 2/von Rechten Infantry Regiment – yellow flag – is in line. Yet more shoddy treatment of the Saxons by their French allies / overlords! ⚠️ Photo care of John H.
Yet more dice have arrived at Neu Schloss von Peter from the dice peddlers at Dice of War. The drip feed of national dice continues with eagles being the theme this time around. Austrian dice in yellow and Russian dice in green. If von Peter himself can get the photography sorted there will be a “The Heroes of Wagram” or some such presentation upcoming. This will present the newly formed Austrian troops recruited for the Wagram games and perhaps some of the refurbished troops as well. But hopefully not next time. Next time von Peter himself will be reporting on an event he is very much looking forward to. Hopefully! This popular title was fIrst published in 1974 but has now been considerably enlarged and includes those troops from Portugal and Spain who served with the Army as Troupes Etrangere during the Revolutionary and Napoleonic Wars. Now includes all new colour artwork and illustrations by well known authoritive and contemporary artists. As usual the e-book is packed with history, unit organisation and uniform details for a surprisingly large number of units. Hard to beat for and hard to go wrong for £3.99. The dice folly continues. More of the products from Dice of War have arrived to provide close dice support to their national army. French dice – of the laurel wreathed “N” type – and Saxon dice have now been safely obtained. Yet still the dice madness continues. Austrian and Russian dice are now back in stock so the appropriate procurement documents have been despatched. Which only leaves Bavarian and Polish dice to complete the set for the locally raised Napoleonic armies. two Prussian mounted Feldjaegers and their horses. There’s actually a third Feldjaeger deprived of his paint stand (horse) and out of sight. All work on the above was put on hold with the demands of the pre Wagram work schedule … and sadly has yet to recommence! four figures for the last stand of the Saxon 1/Prinz Frederich August Infantry Regiment. the second to last stand of the Saxon 1/Prinz Frederich August Infantry Regiment. Saxon 1/Prinz Frederich August Infantry Regiment awaiting the reinforcements above. the mounted adc from Calpe Miniatures Saxon pack SC3. By way of explanation von Peter himself provided a small Saxon brigade for the Wagram games. The thought occurred that it would probably be nice to supply a commanding officer of a Saxon disposition for the brigade. This figure on his temporary one man and his horse base is the result of that thinking. If the commanding colonel and adjoint – see the Front row above – ever get completed all three figures will be grouped together on a single base. Four packs of 4Ground trees have just arrived. Ordered on the 5 September from England with delivery on the 11 September in New Zealand. Not a bad turn-a-round. von Peter himself had performed his pre purchase internet snooping on these trees and was pleased enough with what he read to get these trial sets of trees. If they are a success there will be more imports of lumber in the future. 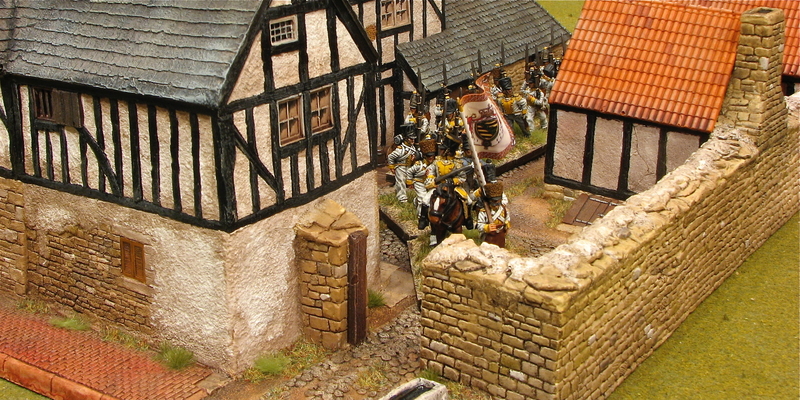 Above: The first battalion of the Saxon Prinz Maximilian Infantry Regiment marches through a village somewhere in Saxony in 1813. The Allies are out there somewhere and the village may soon be the site of some bloody fighting. Don’t forget to click the pictures for a larger and clearer view. Once upon a time long long ago von Peter himself and The son & heir were fortunate enough to visit Salute Zero Nine the 2009 iteration of the famed Salute convention in London. It was their first ever major wargames show and it was quite the experience and eye opener. 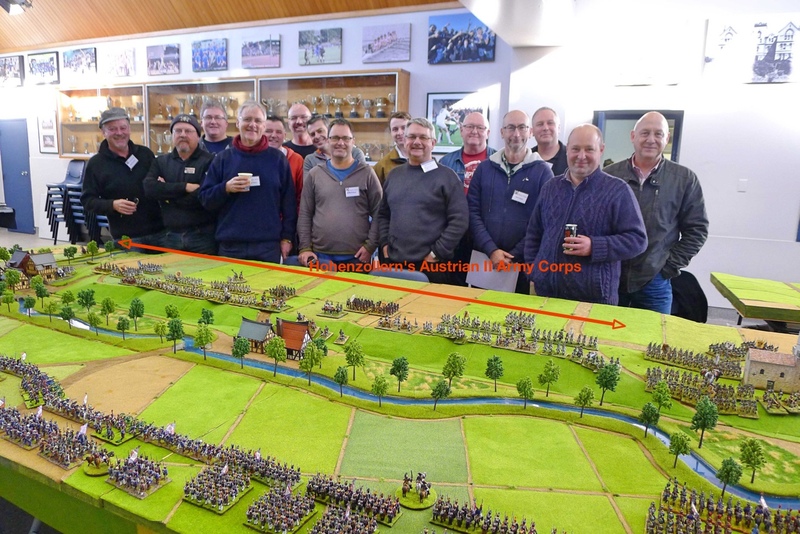 Above: Barry Hilton’s Peninsular demonstration game for Victrix at Salute Zero Nine. 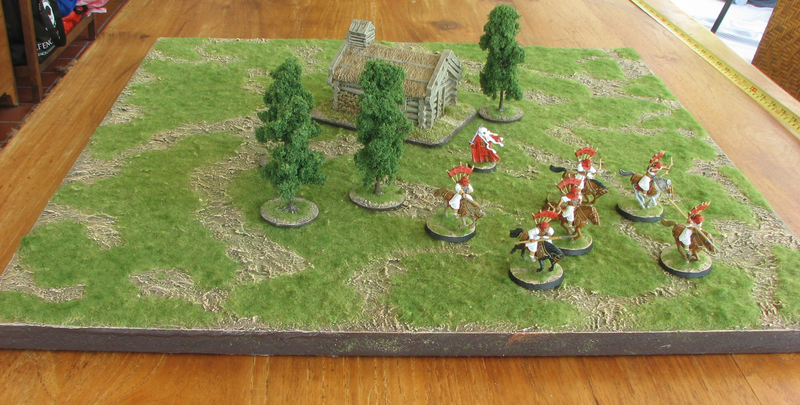 The game was played using Barry’s The March of Eagles rules which at the time were provided in every box of Victrix plastics. I wonder if they still are? Catastrophically a repeat Salute visit is not to be scried in von Peter’s Crystal Ball of Future Seeing. No matter how hard it is rubbed. So it is with a tinge of envy that this blog reports on some of the pre-order discounts available to the attendees of Salute 2017 which by the way is scheduled for 22 April 2017. Wargame News and Terrain have the article Salute 2017 Convention Pre-Order Discounts Summary for them fortunate enough to be heading off to Salute 2017. Some vendors have been of a thoughtful enough disposition to open up the discounts to them not so fortunate to be attending. Not only will The dear reader be able to avail themselves of discounts if they attend Salute 2017 but they will also have the chance to view a demonstration of the incoming General d’Armee rules by Dave Brown. Gardening at Dresden will feature apparently. This from the Lard Island News. 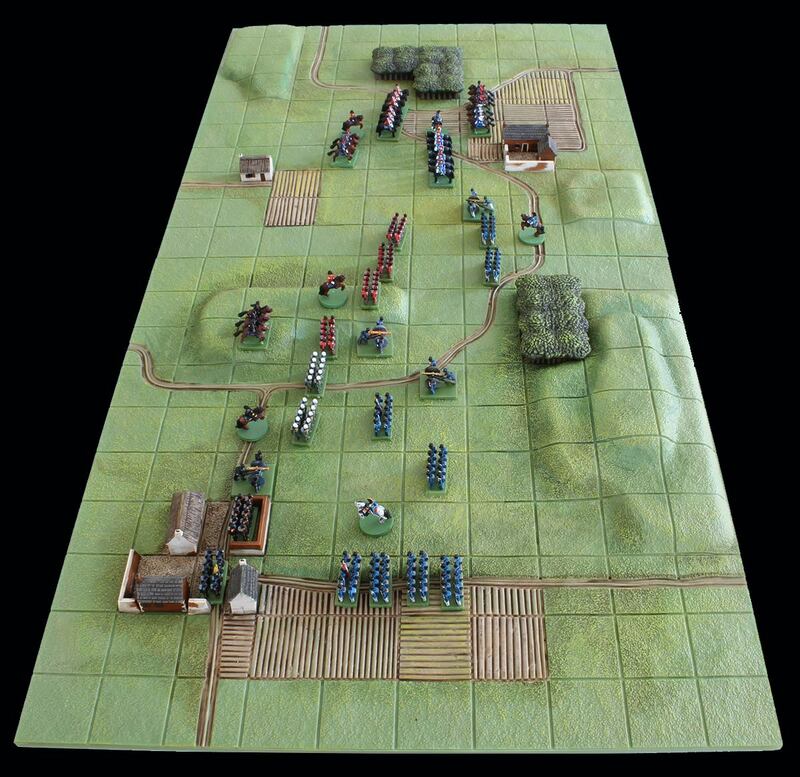 From the same source comes the news that the these same General d’Armee rules will be released at Partizan on the 21st May. This is a slippage from the previously mentioned April but in the end it will be what it will be. Hopefully a tantalising pre release deal or two will be offered on the TheTooFatLardies site. Alan Perry has painted the soon to be released TravelBattle to represent Waterloo Allies and their French opponents. s painted game in a box? See the Perry Miniatures Facebook page for more. Above: In 1809, the Royal Fusiliers joined an army sent to capture the French colony of Martinique. After a difficult fight, the French were besieged. Four days later they surrendered and three Eagle Standards were captured by the British. The Royal Fusiliers were awarded this standard as a reward for their accomplishments in the battle. Above: Continuing the Russian cavalry theme of the last post von Peter himself is pleased to present the celebrated Russian St. Petersburg Dragoon Regiment. In 1813 they were brigaded with the Elizabethgrad Hussar Regiment – here seen in support in the distance -in the brigade of Generalmajor Manteufel. Wargames Foundry Russian Dragoons sculpted by the Perrys. Pigments applied by Greater Queeg. And FYI the command stand to be seen between the two regiments is not Generalmajor Manteufel but rather some passing cossack commander. Click for a larger and much clearer view. Publication is set down for April 2017, ie. this month. A slight deviation resultant of researching the previous General d’Armee item. General d’Armee is to be published by Reisswitz Press – the part of the TheTooFatLardies conglomerate which publishes rules not written by the TooFatLardies themselves. One of the TooFatLardies successful rules is the WWII platoon sized Chain of Command for which TooFatLardies have published several Pint Sized Campaign scenario books. Just published is the Pint Sized Campaign Storming the Citadel – Grossdeutschland Attack at Kursk. This Pint Sized Campaign for Chain of Command is the first covering the attack of PanzerGrenadier Division Grossdeutschland at Kursk. So it appears there will be at least one more Pint Sized Campaign charting PanzerGrenadier Division Grossdeutschland’s experiences at Kursk. So why does von Peter himself mention it here? Partly because if he was ever to model an elite WWII German formation then something from PanzerGrenadier Division Grossdeutschland would probably be it. A large part of the reason for this is due to the book The Forgotten Soldier by Guy Sajer who recounts his experiences on the Eastern Front much of it as part of Grossdeutschland. A recommended if somewhat sobering read of a German soldiers experiences on the Eastern Front in WWII. There is / was some controversy around the book but this does not detract from a riveting read. Recommended. Above: the latest edition of The Forgotten Soldier has a different cover to von Peter’s current edition* and is now illustrated. * von Peter himself has bought the book twice as he lent out his first … and it never came back … sob! 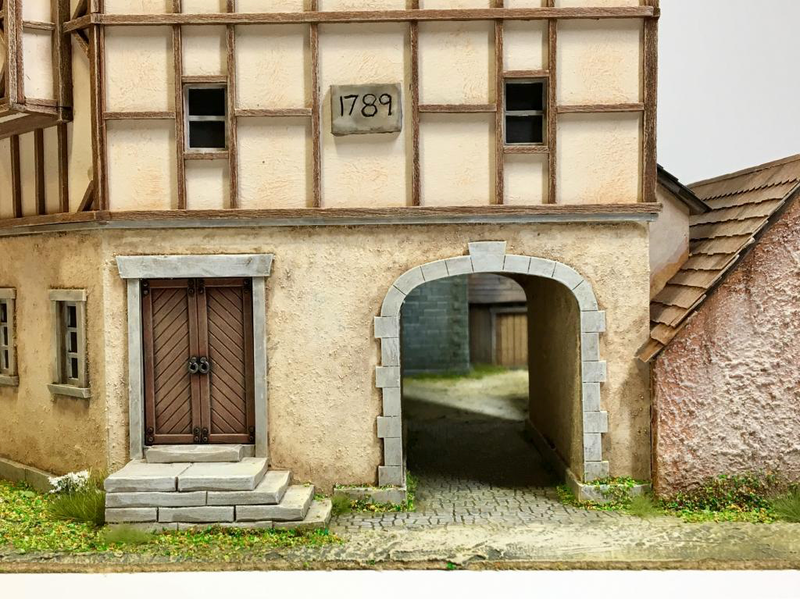 Fireforge Games previewed this sneak peek picture of their next release. Rumors are that these are plastic Byzantine or Goth Infantry, we can only hope! In an effort to bring a little bit of high tech life to their gaming tables Garage Gaming Terry and von Peter himself have jointly procured some Flickering Explosion Markers from Annie at Bad Squiddo Games. These are just flickering electric tea lights with some fluffy material stuff coloured and glued on top. There are several ‘how to’ guides on creating these on the ‘webs but for £2.00 each when you buy between five and nineteen of them why bother? Time is money and time is also exceedingly precious. There is some suspicion that some of von Peters terrain items will be suffering from fires in the nearish future! a Napoleonic civilian. She is complete and needs to be based … which has a raised an issue. von Peter himself has plenty of bases of all sizes for various armies periods etc. They tend to be of square / rectangular shape and too large for this single figure. A round base would seem a better choice. Hmmm. three Prussian mounted Feldjaegers. 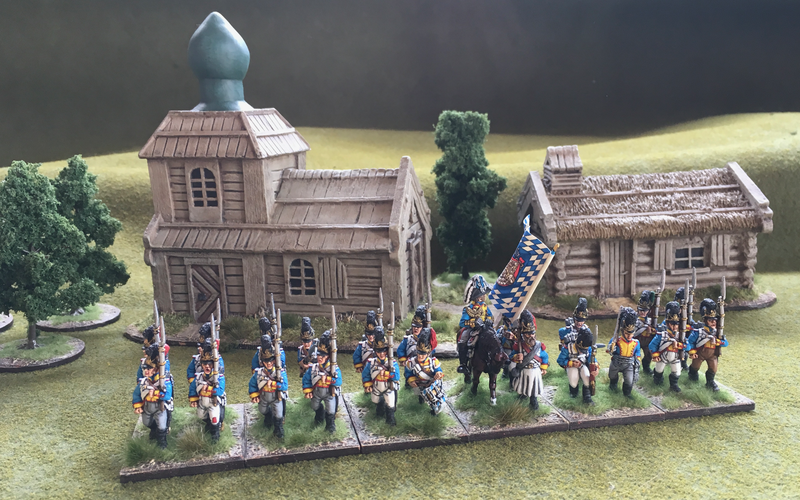 One was to be painted as the start of a Prussian command stand – von Peter himself is well short of proper Prussian command stands. Then von Peter himself thought that if he was painting one then he may as well paint one of the two Feldjaegers that he has in stock to be single ADC type figures for the Prussians. And then von Peter himself thought that if he was painting two then he may as well paint all three of the Feldjaegers that are in his immediate future. 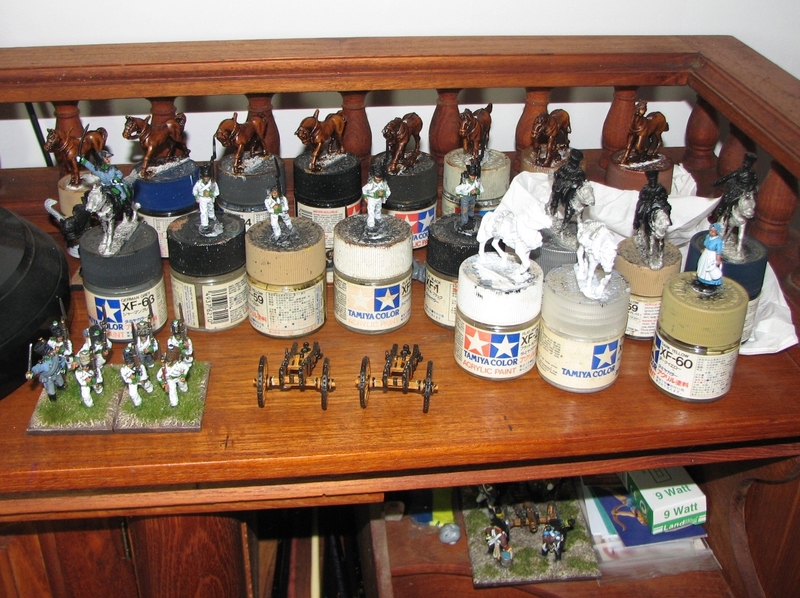 So three mounted Feldjaegers sit on dummy horses for painting purposes. They are undercoated in black. the Prussian Feldjaeger as part of a Prussian command stand. And for the record the Austrian battery hiding at the bottom of the picture is being used as reference for the Austrian 12 pdrs. Oh, and click the picture for a larger and clearer image.